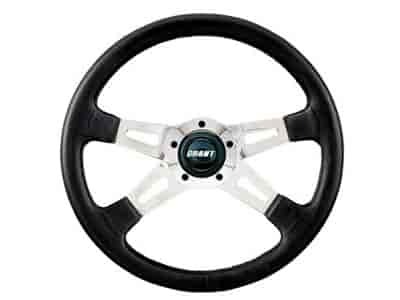 The Collector Series Steering Wheels feature a machined aluminum, polished to a mirror finish center. They are the ultimate look for any street machine or truck. The four spoke designs feature the Grant exclusive three dimensional dual-plane spoke design. The grips have hand stitched genuine leather covers. Each wheel is supplied with billet machined trim ring and black rubber styling sleeve.